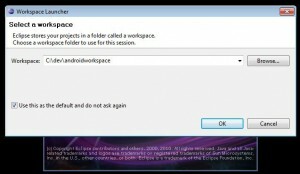 This is a walkthrough on how to get started developing android applications in windows with Eclipse. 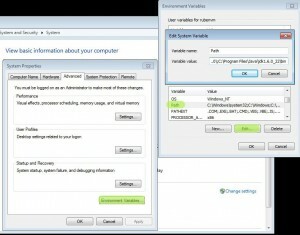 I will be using Windows 7 but the steps are similar in Vista and XP. This article assumes little prior knowledge about Android. The reason for using Eclipse is because there exists an Android development plug-in for Eclipse, which makes things easier for us developers. Also, Eclipse is a good and Open Source IDE. Eclipse can also be used for other languages such as PHP, C++ and Ruby, it also has a very good Subversion plug-in for using repositories. Developing Android applications, and using these tools described here, does not cost you anything. 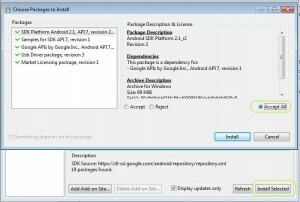 Android SDK: This contains a bunch of development tools. AVD: AVD stands for Android Virtual Device, and is a device you can use to test your applications on. 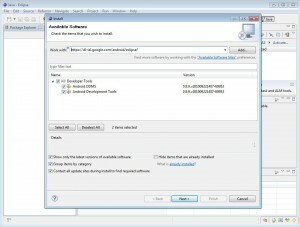 ADT: Android Development Tools is a plugin for Eclipse, which makes developing Android applications much easier. With this plug-in you can easily create new android projects, create GUI for your application, manage internationalization, debug your application, and testing you app on your AVD, or directly on your real device. We will first need to get a couple of tools, before we install the tools, and configure them properly. 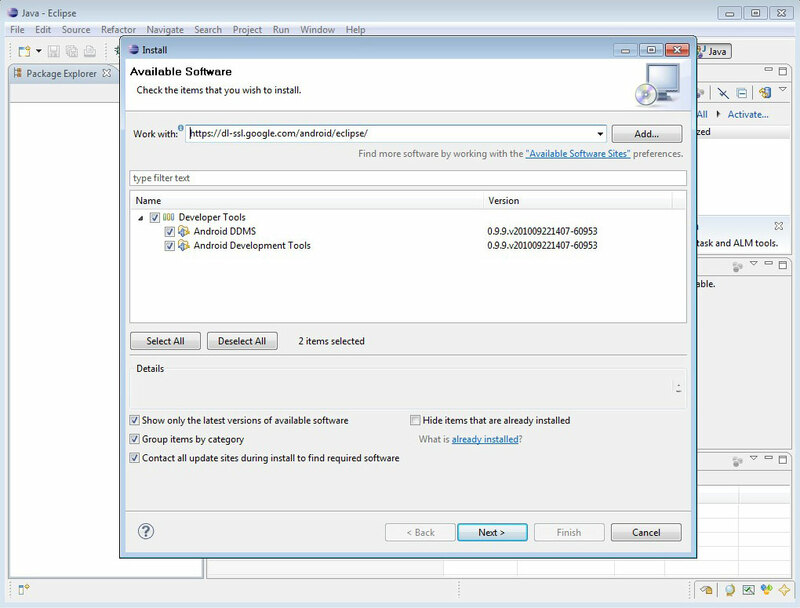 First off, if you don’t have Sun Java JDK installed already, go ahead and download it. Use the 32 bit version, as pointed out in the comments below. 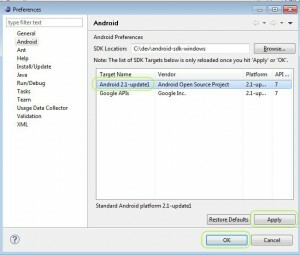 Then get the android SDK for Windows from here. The current filename is android-sdk_r07-windows.zip. And that’s all the tools we need. I would recommend installing tools like these to a folder that has a path without spaces in it. First install Java JDK, which also will install Java JRE. Create a new environment variable to point to where you installed Java JDK. 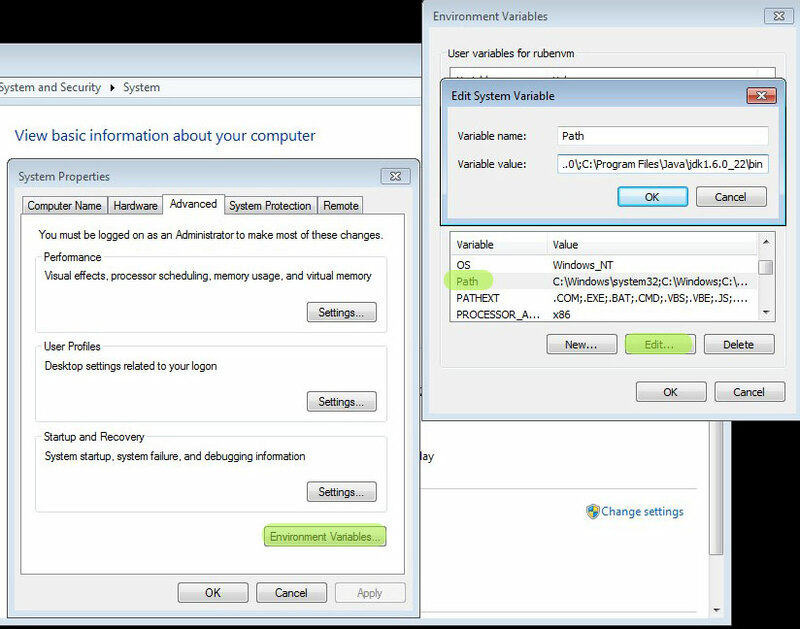 Choose the PATH variable, click Edit, and add the location to you JDKs bin folder, at the end. Remember to add the ; to separate this path from the other paths. Then hit Ok and Ok.
And you should see something like java version “1.6.0_22″ etc… Then you know the installation was successful, and we can continue. You can add the tools directory in your SDK folder to your PATH variable (like we did above) to get easy command line access to various tools. To install Eclipse, simply unzip the .zip file. I put Eclipse in my C:\dev\eclipse folder. 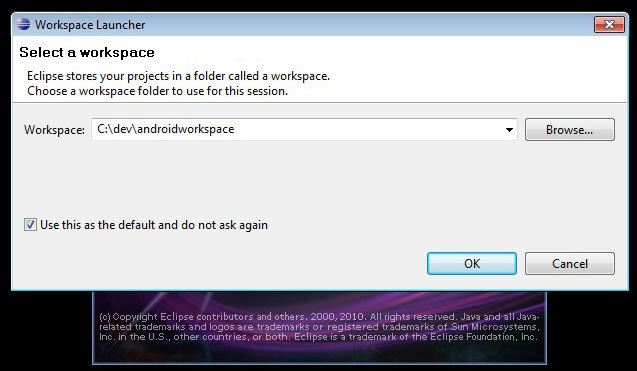 First time you start Eclipse, you can select a workspace, Eclipse uses the workspace to store your android projects, plug-ins etc. I like to know where I find this folder, so I put it in my dev folder. You now have Eclipse running, and we need to install the ADT plug-in. And hit enter, you should now see the Developer Tools in the list below. Check all of them and hit Next. On the next screen for reviewing your updates, hit Next. On the next screen with licenses, accept, and hit next. “Warning: You are installing software that contains unsigned content….” Hit Ok. When the installation is finished, hit Restart Now. 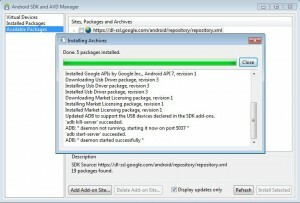 Tip: Sometimes the ADT plug-in gets updated, you can install those updates by going to the Check for updates under the Help menu And then check Android DDMS and Android Developer Tools if any updates are available. After installing our tools, we need to configure them properly. 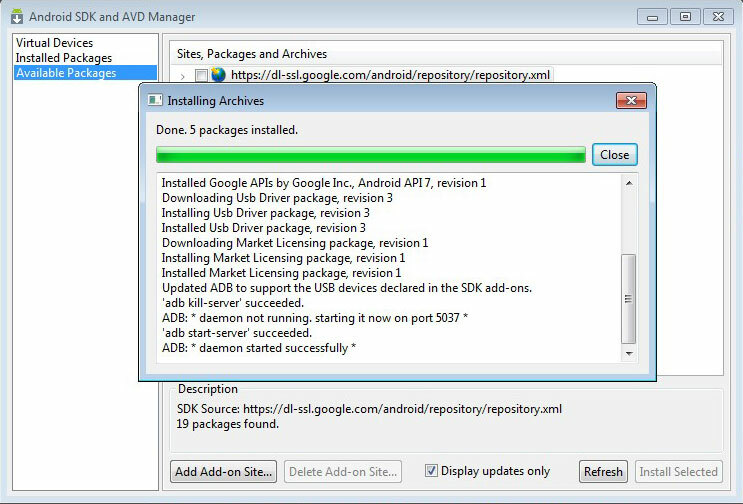 Now we need to show the ADT plug-in where we installed our android SDK. In the menu bar, hit Window ->Preferences, and go to the Android tab. Now browse to the location of where you installed the SDK, mine was C:\dev\android-sdk-windows. You now (hopefully) have your Eclipse IDE set up right, and we are ready to start developing. 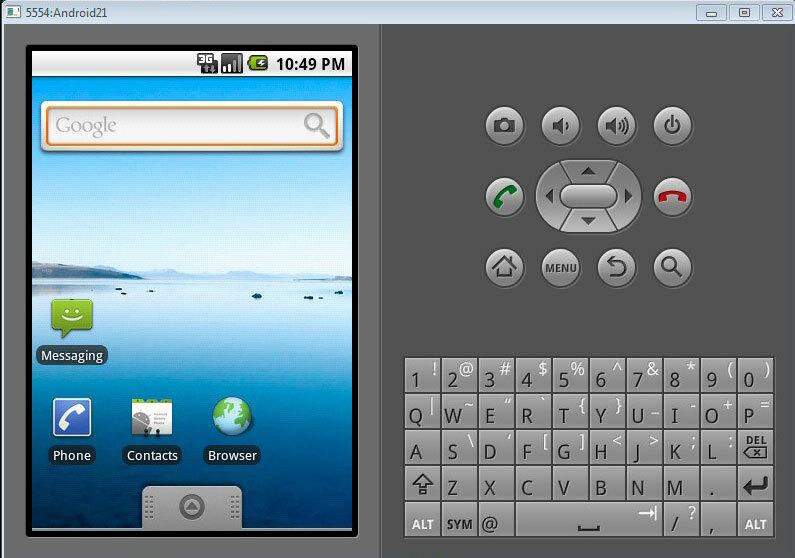 But first, we need an android device to deploy and test our applications on. 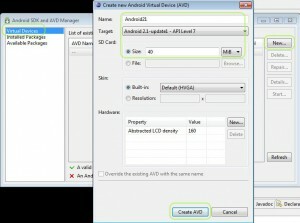 Hit the little box with a green android in it in the Eclipse menu bar , this launches the Android SDK and AVD Manager. Under Available packages, you can choose which device you want to test your applications on. 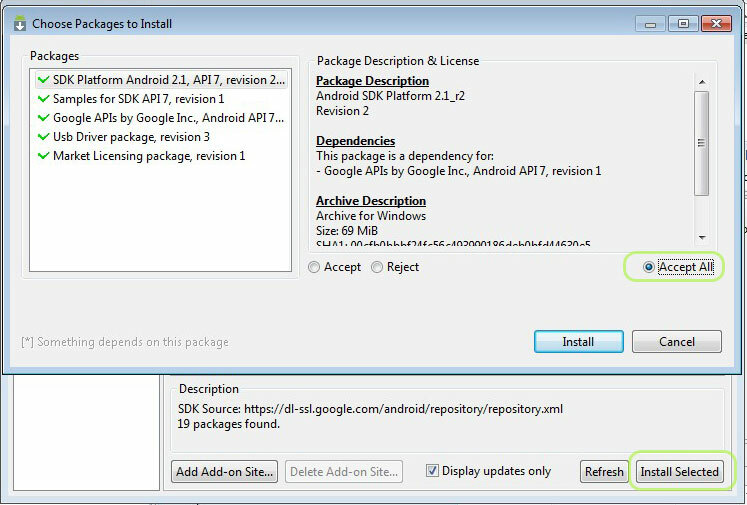 For example API7 is Android 2.1. The download may take a couple of minutes depending on your internet connection. When it is finished, select Restart Eclipse and thenClose. Close the AVD manager and restart Eclipse. 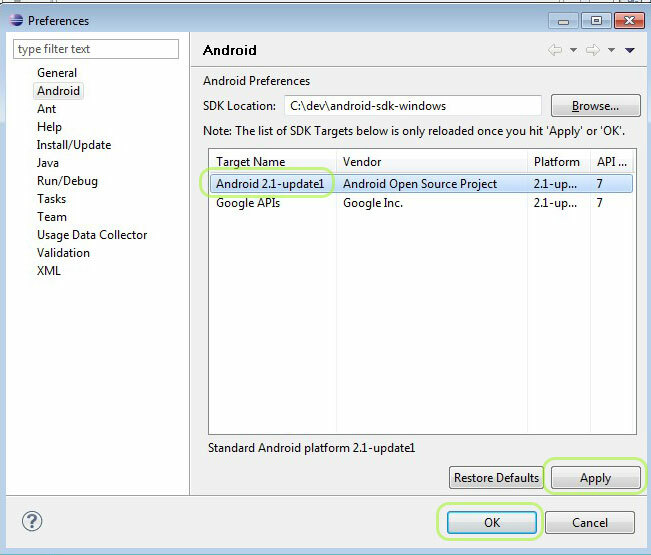 Open Window -> Preferences -> Android, and make sure an SDK Target is selected in the list, otherwise choose “Android 2.1-update1″, Hit Apply and OK.
Open the Android SDK and AVD manager , and then the Virtual devices menu. You have earlier downloaded the files for the android virtual device, now it’s time to install it. Hit New, and Enter a name for your device, and choose the android 2.1 API 7 that we installed. You may give it a couple of MB SD Card storage too. Then hit Create AVD. We now have an AVD installed, if you want to launch it, select it, hit Start… and then Launch. You are now ready to begin developing android apps! If you want to try out the new Gingerbread (Android 2.3) AVD, you can check out this similar guide on how to get it up and running!